Among the dirt roads and nature, take the small exit that leads you to SW 153rd Ave, and you find yourself surrounded by green pastures, stalls and leather saddles. Upon arrival, six friendly horses greet you with their neigh, eager to walk around their 40- acre facility, trained to make the time special that you spend with them — whether it’s an hour a week or once a month. It is the guiding hand of Cathi Brown and the team at HOPE that makes this operation work. Brown started out volunteering as an equine specialist while working toward her master’s degree in exercise and sport science with a specialty in adaptive physical education and a master’s in occupational therapy at the University of Florida. After working as a volunteer for some time, she realized that in order for the business to grow and serve more people, some things needed to change. 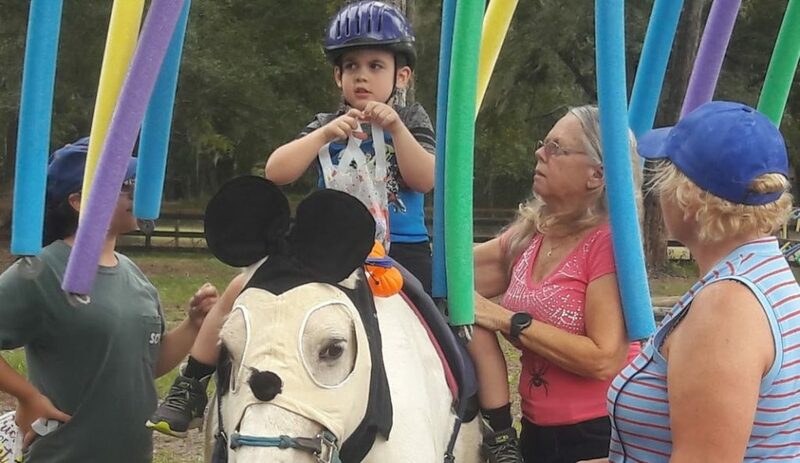 HOPE stands for HOrses Helping PEople and is an equine-assisted therapy facility located in Alachua County. 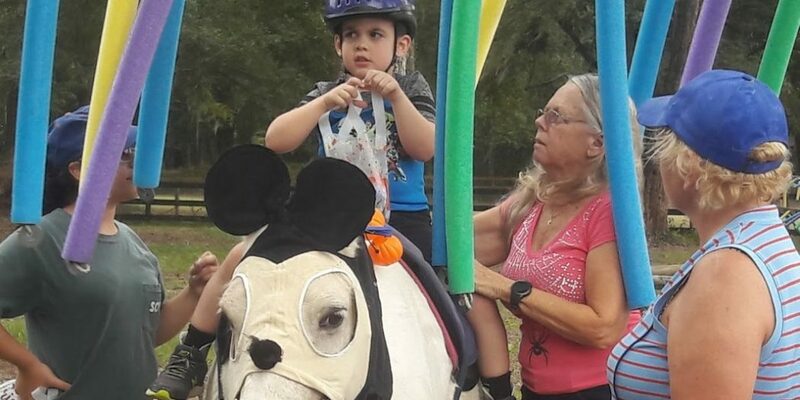 Through its various programs, HOPE has been making an impact in the community by providing equine recreational therapy, assisted psychotherapy, occupational therapy (this treatment targets the psychological, physical, and cognitive aspects of the patient), among other programs. Through its various programs, HOPE is shining a light and making a difference for their patients. Their programs include occupational therapy, which incorporates hippotherapy, Horses Helping Heroes, designed to assist military veterans, service personnel, first responders (free of charge), Special Olympics participants, at-risk youth, and people addicted to drugs and alcohol. 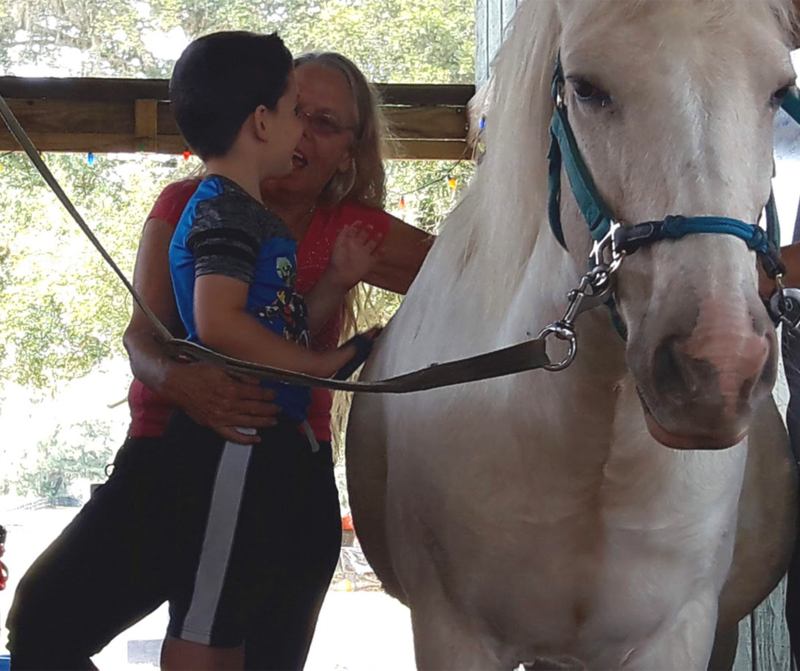 Cathi Brown carefully guides Jack, 5, through the grooming process of the horse, Sunni. 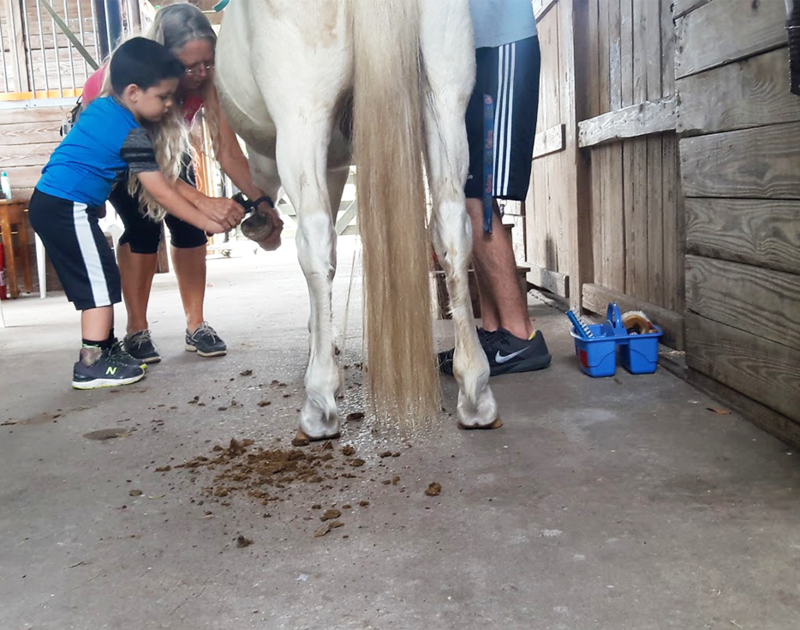 All therapy sessions starts with each patient grooming the horse they will be working with in order to create a relationship and routine. HOPE recently collaborated with Alachua County Victim Services, creating a support group for sexual assault victims. Its newest program, Breast Cancer Survivor Outreach Rehabilitation Program, is a program designed for post-treatment cancer survivors. It does not involve riding lessons but rather a human to horse skin contact. The program will guide patients into the movement of the muscles, the grooming, the building a relationship of trust with the horses. “Women don’t want to be known as survivors, they want to move on from it,” Brown said. She explained that while she has not faced breast cancer herself, loved ones have and they all want the same, to move on and live. Equine assisted therapy, also known as equestrian therapy, is an experimental health treatment. Through this program, patients have the opportunity to interact with horses. Equine-assisted therapy is often incorporated into a wide variety of issues, such as mood related issues, autism, cerebral palsy, eating disorders, trauma and post-traumatic stress (PTSD), learning difficulties and more. HOPE started as nonprofit in 1999 as a backyard organization and it was incorporated in 2000. 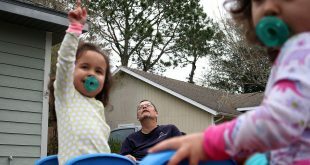 With the passing of the years, the program grew into a 40-acre facility, located in Archer in Alachua County. Brown, who is now an occupational therapist, co-founder, director of programs and therapy, and board treasurer, explains she fell in love with the program in the 1990s and has stuck to it ever since. 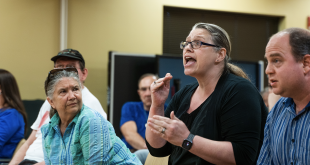 The program, which was originally a nonprofit organization, has switched gears over the years, “it is a very cost-intensive program to have,” Brown said. 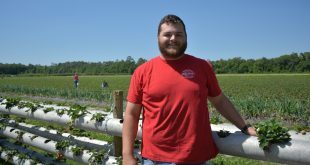 The farm is lease free from Dr. Anthony Mancuso, radiology specialist at Shands Hospital who serves on HOPE’s advisory committee. HOPE also counts with 20- 25 volunteers, Cindy Kiers as barn manager, who lives on site, and Brown, who is at the farm every day. The budget, Brown explained, can vary depending on the time of year. Feeding, which consists mostly of hay, is bought during the winter months at a cost of $6,000 a year. For the rest of the year, the horses are pasture fed, veterinary, depending of what needs to be done to the horse can be up to $ 2,000 a year, among many other, resulting in $78,650 for total expenses. “Health insurances do not always cover all sessions, and each session, except for the Horses Helping Heroes program, are $100 for the hour,” Brown said. 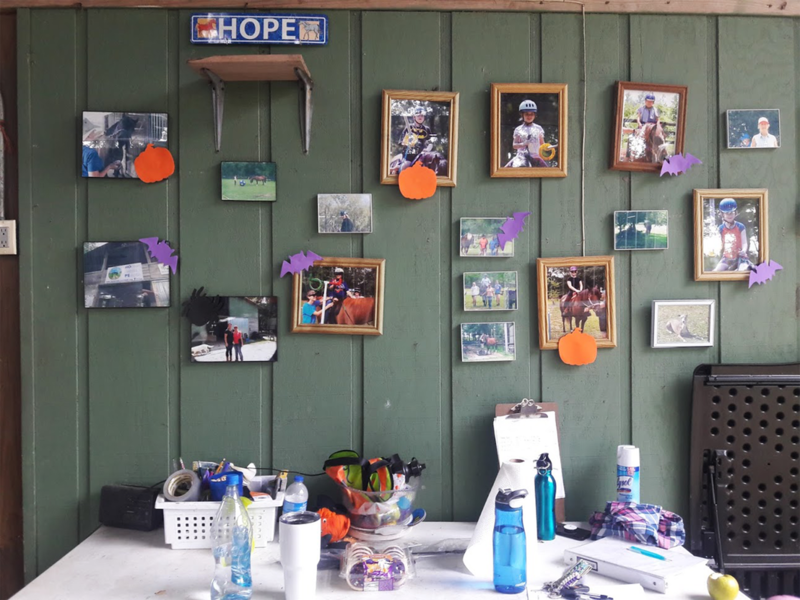 Work station at HOPE, pictures of their patients hang proudly in the barn. In order to make the programs more accessible to those in need, the HOPE team have created scholarships and fundraisers in order to help those who cannot fully afford the programs. Brown believes that these events give the opportunity for the community to come together and learn about the program while raising money for the scholarships. “It is also a great opportunity to families and some of our patients to get to know each other, since most of the sessions are one on one,” Brown said. HOPE, as Brown said, opened new doors for their patients and strives to create better ways of life. 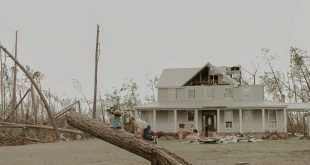 “There is something about building a connection with a horse that makes you live in the moment,” Brown said. For more information regarding the programs, volunteer opportunities and events visit HOPE’s website.